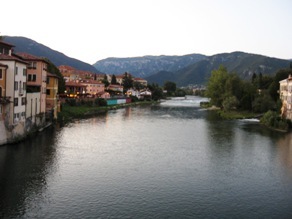 Bassano del Grappa is set in one of the nicest areas of Italy and has changed very little for hundreds of years. Logic would therefore have it it has to be very nice. And it is, with interest. The main draws of the town are the River Brenta and old wooden bridge which I guess also has changed very little for decades. The top of the bridge has a small shop selling the local delicacy, a drink called grappa which is, I believe, made with the grapes left over from the wine harvest. Fire water, I don’t drink but I had a grappa for the experience and it was, sure as anything, very strong. Not too expensive though, surprisingly. The focal point of the walk was the bridge, Ponte Vecchio which even more than the square sees families and mainly young people relaxing together. 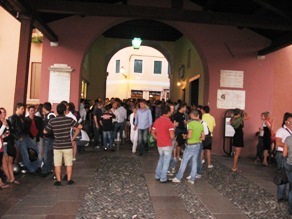 There doesn’t seem to be any stress in Bassano del Grappa, maybe the local tipple does more than sustain a moderate flow of curious tourists. But the acoustics are magic, the sound of laid-back chatter under the stone arches was like music which, once again, won’t have changed for centuries. I stayed in Bassano for two days, I stayed in a very nice hostel which seemed devoid of guests, certainly on the first night on which I seemed to be the only person there. So I went out into town and experienced one of the most beautiful things to be seen in Italy, the passeggiata. 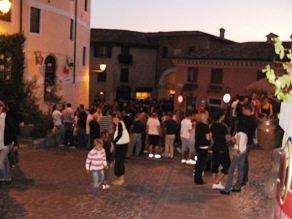 Sunday afternoons in Italy are devoted to the spirit of the town and its traditions, as the people leave their homes and amble peacefully through the centre stopping to talk to friends and make new ones. The passeggiata is a sight to behold in any area of Italy, but in Bassano it had a certain magic which I may bear in mind when I decide to move back to Italy. It’s not a big town and as such doesn’t have many grade one tourist attractions, but it’s generally nice and a very good example of historical Italy. It’s also a good place to go to find modern Italy, certainly as regards fashion and good food, there being a range of very good cafes and restaurants. They didn’t seem too expensive either. There’s also a lot to choose from for those who want a night out, the best bars seemed to be those in the square, or just aside the top of the bridge. I went to a bar called Samsara which specialises in real beer, no interest to me but I found it a nice place and hopefully made a friend there who’ll keep in touch beyond the emails we’ve exchanged so far. Choosing Bassano as a base for a holiday would be a smart move, you’ve got Venice an hour away on the train, Verona and Vicenza locally, and you’d be within a few miles of the Dolomites, and some of the most stunning scenery anywhere. 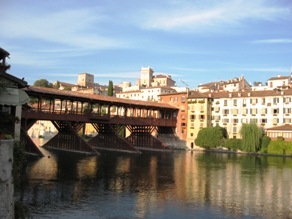 I was offered a job in Bassano once, just ahead of moving to Verona. I won’t say I regret it but Bassano is cool, Verona likewise but I know where I’d go if I had the same straight choice now.